Here's a tool Jane Jacobs would approve of: The Storefront Index, created by Joe Cortright and Dillon Mahmoudi of Portland, Oregon–based think tank City Observatory, measures the quantity and density of retail storefronts in cities throughout the Unites States as a proxy for urban desirability. The Storefront Index is predicated on the assumption that the amenities of the "consumer city"—places to get manicures, burritos, a nose piercing, a picture framed—encourage walkability, connect public spaces, and make cities desirable places to be. Mahmoudi and Cortright posit that "the presence, number, and size of storefront businesses in a neighborhood is a new, key indicator of urban economic health and neighborhood vitality." City Observatory hopes planners can use the Storefront index to assess the efficacy of small business growth and retention strategies, as well as plan for walkable retail development in downtown corridors. The index maps every store that provides the goods and services that facilitate everyday life, but excludes banks and hospitals, as well as stores that sell goods to other manufacturers. Nationwide, there are approximately 2.6 million storefront businesses. In the 51 largest metro areas, there are about 537,000 storefront businesses. What makes a storefront cluster? By Cortright and Mahmoudi's count, storefronts had to be within 100 meters of another storefront. They drew a three-mile radius around each city's Central Business District (CBD), but mapped storefronts outside of that, too. The concentration of storefronts varies drastically from city to city, and confirms what you may instinctively sense from strolling through St. Louis, say, or Philadelphia. The former has a low density of storefronts in the urban core and large areas with no storefront clusters. St. Louis has 426 storefronts in its CBD, coming in front of only Detroit (91) in 51 metro areas surveyed: Philly, on the other hand, has high density clusters scattered throughout the city. The metro area has the fourth-highest number of storefronts in the CBD: Planners, urbanophiles: Rejoice in this new spatial analytic tool, and see how your hometown's storefront index stacks up against neighboring cities. [Editor's Note: Peter L. Laurence, author of Becoming Jane Jacobs, noted on Twitter that some of Jane Jacobs's 100th anniversary coverage mischaracterized her contributions to the field of city planning. AN reached out to Laurence for comment, and he responded with this essay.] May 4, the centennial of Jane Jacobs’s birth, was a big day for her fans. Thanks in part to a Google doodle, Jacobs trended hard against Star Wars Day (#Maythe4thBeWithYou) and gained some new fans and readers; to the benefit of all interested in cities and urban design, sales of her 1961 classic The Death and Life of Great American Cities spiked on Amazon. May 4 was also a field day for Jacobs scholars and students, because it was an opportunity to see how her reputation has changed over the past five or six decades and whether new scholarship in the decade following her death has made any impact on this. 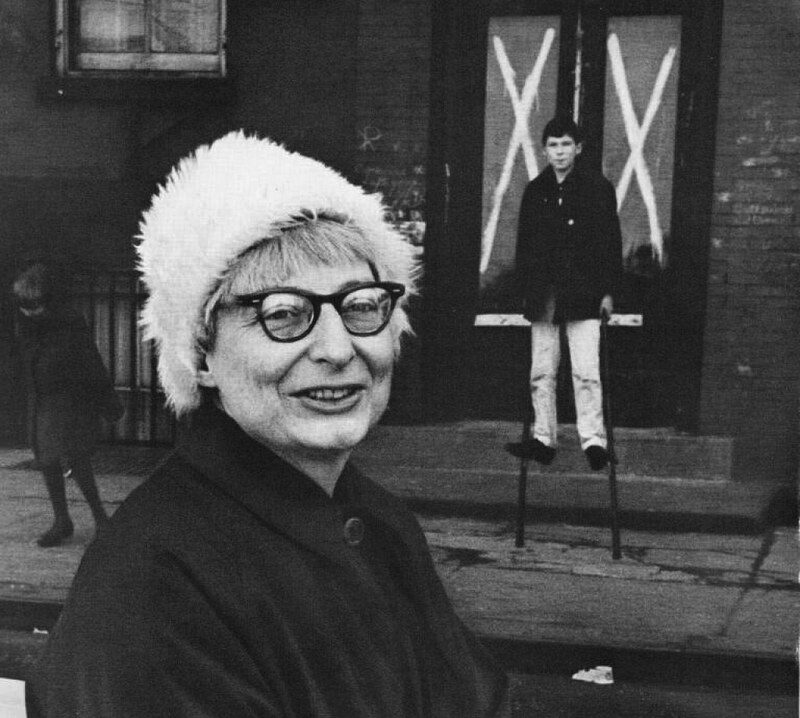 It has been an opportunity, in other words, to observe how Jane Jacobs is deified and demonized, and how the Gospel of Jane is now interpreted. In at least one overarching respect, little has changed in fifty years: Jacobs, playing the biblical David, is still frequently defined in opposition to a Goliath. When her great book came out, Goliath took the form of an amorphous beast called City Planning, which was then synonymous with Urban Renewal. In the postmodern decades, it was Le Corbusier as the embodiment of modern architecture. Today, the monster is Robert Moses. This is not new. “Bob Moses’s block-busting method” was criticized years before Jacobs wrote about it; Moses was already notorious and she didn’t need to say much about him in Death and Life. However, Moses’s shadow continues to loom over her, despite the fact that her true adversary was a leviathan composed of city halls, city planning and redevelopment agencies, real estate developers profiting from urban renewal policies, highway authorities, suburbanism, and public inertia. 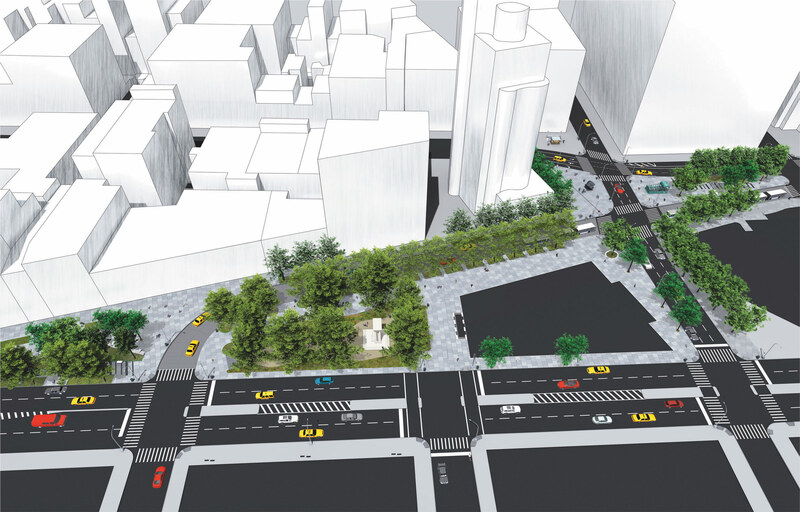 Among her major battles in Manhattan, Moses wasn’t behind the scheme to redevelop the West Village; and the Lower Manhattan Expressway, which received support from picketers who saw short-term gains in construction jobs, among others, was bigger than Moses and outlasted him. Fueled in part by the anger that activism took away from writing her second book, The Economy of Cities (1969), Jacobs described LoMEx as a beast that had to be killed three times, in 1962, ’65, and ’68, by which time Moses’s political power had been also fatally wounded. Today, the Urban Renewal Administration and its regime, which she helped to kill, are long dead, and the field of city planning, which she helped to change, is a very different field than it was a half century ago. However, we glory in the story of heroes and villains. Like the forthcoming opera about Jacobs and Moses, these can be subtle and beautiful works of art that help us to remember the past and introduce its history to a new generation. But the passage of time has also distilled Moses into a mythological figure, symbolizing all top-down planning and the whole complex but largely forgotten history of postwar urban renewal itself, making it appear that urban renewal was the work of an evil individual, rather than public policy driven by market forces, racism, and widely shared desires to live in suburbs and commute into cities. (The same has been done with Le Corbusier, as if he singlehandedly invented Modernism.) Once a dualism is constructed (e.g. Jacobs vs. City Planning/Modern Architecture/Robert Moses), certain conclusions must follow and, because this is the way dualist mythologies work, if Moses represents top-down planning, large-scale infrastructure, and urban change, then Jacobs must represent bottom-up forces, anti-development, anti-change and NIMBYism, preservation, the small scale, and the domestic. Moreover, because a dualism is necessarily reductionist, today, in an era experiencing an urban renaissance that neither city planning theorists of the 1930s nor city dwellers of the 1970s could have imagined, Moses’s villainy reflects not only the success of Jacobs’s ideas, she is blamed for the excessive accuracy of her ideas. A great observer and theorist of urban dynamics, it was not Jacobs’s idea to use historic preservation laws to turn cities into museums; her argument for old buildings had historical and esthetic aspects, but it was primarily concerned with the low-profit and no-profit activities and affordable housing that could take place in them, and it did not exclude new construction. Jacobs opened Death and Life with something simple and “small scale” for her readers, the lyrical “sidewalk ballet,” primarily to illustrate the ways that urban design can enable non-authoritative self-policing and contribute to urban safety, the foundation for any city life; after systematically discussing sidewalks, streets, blocks, parks, neighborhoods, and urban form in increasing scales, she concluded it with something conceptually beyond even the “large scale:” a discussion of the relationship of the history of science with urban history and theory, to which she made the unprecedented contribution of applying the nascent science of complexity to the study of cities. This was decades before chaos theory and non-linear dynamics developed in scientific circles. And while today “self-organization” has become some kind of truism, Jacobs understood well enough that people also self-organize into the suburbs and into more insidious forms of social organization. Because an analysis of Jacobs’s legacy would be incomplete without a criticism, this week we also saw Jacobs accused of being a pioneering gentrifier because her Greenwich Village home and neighborhood, which she identified as a good place to live, increased dramatically in value, most substantially after she moved away. Ironically, Jacobs was not only a pioneering theorist of the dynamics of gentrification, she was an activist against urban renewal projects specifically designed to replace ethnic, working-class “slums” with middle-class and upper-income housing in Greenwich Village and elsewhere. Although she was a harsh critic of middle-class values, she is considered by some to be too bourgeois (while, contradictorily, others cheer, “Less Marc Jacobs, More Jane Jacobs”). Jacobs has been accused of not having enough to say about race in a treatise about urban and suburban diversity, in which she discussed discrimination, racial and economic segregation, redlining, and spoke of American society’s “tendencies toward master-race psychology.” And she has been made out to be an advocate of deregulation and apologist for “so-called ‘urban sprawl’,” despite warning against it as early as the late 1950. But her fights with city hall did not mean she was an anarchist or libertarian; she believed in democratic government free from financial influences, well-applied regulations (including zoning) and taxes, support for mass transit and other public services, and public intervention to counteract free-market forces that threatened city diversity and vitality. She was interested in metropolitan government, but understood that great cities were already terribly difficult to govern. Speaking of a city council members’ struggle with “problems which are out of the control of everyone,” she wrote, “These are not boys sent on a man’s errand. These are men sent on a superman’s errand.” When Jacobs finished writing Death and Life, someone observed that it was a long book and suggested that she cut it back substantially to make it easier for the public to absorb. She recoiled, stating, “My own view is that this country is full of digesters, reviewers, and summarizers, and those who do not care to read a book as long as this will get some of the drift of its ideas through those means anyhow.” Jacobs was right about this. There are many Jacobites today, both fans and critics. However, how and why Jacobs is praised and criticized is important. This past week was often a celebration of not only of myths, but cartoons and intellectual shortcuts, among them well-worn ideological pathways to predetermined destinations. Not only do these lead to funhouse mirror portraits of Jacobs (e.g., she was a libertarian), they lead to such slogans as “More Moses, Less Jacobs,” an invitation to despotism that reflects a dangerous historical amnesia, among other forms of ignorance. We have come a long way from the sexist condescension of Lewis Mumford’s 1962 review “Mother Jacobs’s Home Remedies.” She was right about the death and life of cities; her ideas have prevailed and endured. But rather than think that we have reached “peak Jacobs” and that the best way to advance is to circle around to the other side of a false dichotomy, her ideas should be criticized for not going far enough in practice and theory. Her activism to improve car-dominated urbanism and suburban thinking, for example, must continue; there is no sidewalk ballet where there are no sidewalks. Meanwhile, the questions and theoretical paradoxes in her writing must be explored: How do we reconcile Jacobs’s concerns for residential tenure and neighborhood stability in a highly mobile society? How do we manage gentrification and other “self-destructions of diversity” in a capitalist framework? How do we challenge still prevalent forms of racial and economic segregation? How do we reform the governance of great cities? How do we advance cities in an age where nineteenth-century nationalism is still a prevailing ethos? How do we create new forms of knowledge about cities with complexity science without falling into the trap of scientific positivism that ensnared early modernists? 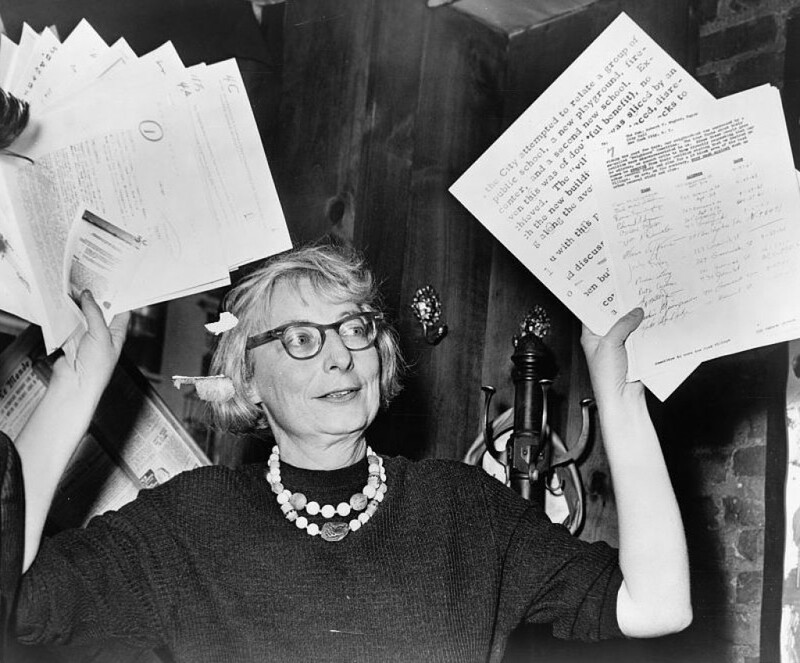 There are many good ways to celebrate and criticize Jane Jacobs. Cartoons and slogans aren’t the best ways—unless perhaps these include “More Jacobs, fewer slogans” or “Fewer slogans, more questions.” Peter L. Laurence is the author of Becoming Jane Jacobs and director of graduate studies and associate professor of architectural and urban history, theory, and design at Clemson University School of Architecture. On this May 4, 2016, Jacobs would be 100 years old. Google has honored her with a Doodle on the search engine's front page, calling her a "fierce protector of New York City's urban landscape." You can read our coverage of her centennial events here and our exploration of her legacy here. 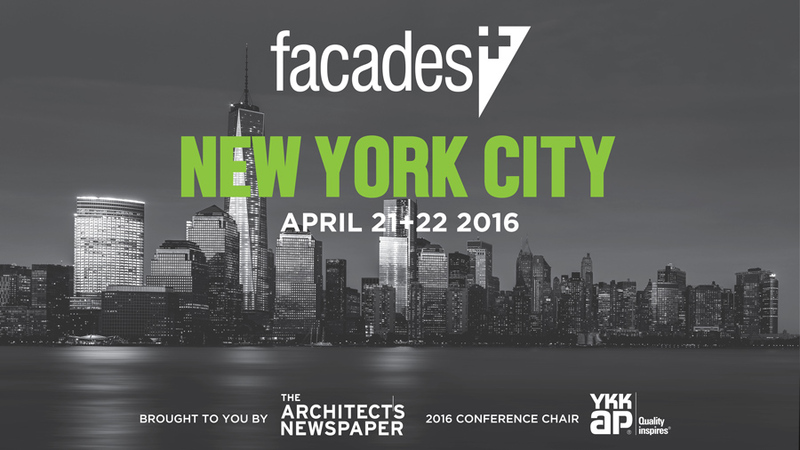 The 18th conference in the Facades+ series was presented by The Architect's Newspaper (AN) at Metropolitan West on April 21. With YKK AP as 2016 conference chair, a record-breaking attendance of over 500 design professionals, 60 other sponsoring organizations, and additional workshops held at New York Law School on April 22, Facades+ explored the potentials of new materials, fabrication processes, and design strategies on scales from single windows to urban districts. Facades+, a mobile event offered several times a year since 2012 (hitting seven U.S. cities during 2016), offers regular updates on high-performance enclosures. Contemporary technologies and materials, participants noted, allow increasing control of light and heat as well as expanding design options; at the same time, specialists argued for tempering expectations about parametric design and renewable power generation. “Glass is really the material of the 21st century,” asserted morning keynote speaker and 2016 Jane Drew Prize winner Odile Decq, discussing innovative combinations of laminated glass with external sunscreens, embedded textiles, and other elements. Decq led the audience through a series of projects employing transparency, color, and stylistic contrasts, including the Banque Popular de l’Ouest in Rennes (with Peter Rice), the Museum of Contemporary Art in Rome, the Garnier Opera House restaurant in Paris, and the Fangshan Tangshan National Geopark Museum in Nanjing. Architecture can look to the auto industry, she added, for advances in safety, self-cleaning, and energy management that are adaptable to buildings. In contrast, rising energy concerns mean that “glass is no longer king,” said Buro Happold's Jonathan Sakula; it is part of a broader material repertoire. Stringent codes often make triple glazing difficult to avoid, he noted, despite disadvantages in weight, acoustics, and cost. Responding to an audience question about curtain walls as media for power generation, NY conference co-chair KPF's Shawn Duffy suggested that building-integrated photovoltaics are not yet realizing their potential. Among featured buildings with concrete or masonry façades, standouts included DDG's 12 Warren Street condo clad in Catskill bluestone, discussed by Peter Guthrie, and S9 Architects' 205 Water Street, a gritty neo-brutalist grid of board-formed concrete and exposed steel where, in engineer Stephen DeSimone's pithy phrase, “the structure is the façade.” Technical briefings covered distinctions between fire-resistive and fire-protective glazing (Tim Nass of Saftifirst), woven-metal shading (Tom Powley of GKD-USA), and a dramatic breakage test by Kuraray's Mark Jacobson comparing polyvinyl butyral and SentryGlas ionoplast interlayers (hammer blows to the edge shattered both panes, but only the latter resisted crumpling). YKK's Bang Ting Tan described a top-down curtain-wall retrofitting method that outperforms conventional procedures in safety, weathertightness, and work-cycle efficiency. Tension between design ideals and constraints of economics, zoning, context, and client input was a recurrent theme. In a panel on Related's 17-million-square-foot Hudson Yards, William Pedersen commented that “the ability to achieve structural purity in a speculative office building is almost impossible” because dimensional requirements guide formal gestures. Yet the Yards hardly shortchange aesthetics: KPF's chamfered-cornered north and south towers will “perform a choreographed dance” near the High Line and the ETFE cushions of the Culture Shed by Diller Scofidio + Renfro / Rockwell Group, and Tower D by the latter team plus Ismael Leyva Architects will morph from a rectangular base to a quatrefoil as it rises. Neil Thelen (Thelen Design Group) hailed the subtleties in this tower's residential entrance of CNC-milled stone and the curtain-wall panels' complex geometries. Another high point was Thomas Phifer's afternoon keynote presenting designs from the Salt Lake City U.S. courthouse to the Corning Museum of Glass, augmented by a Q&A with AN's Matt Shaw considering local variations in light quality. “The light is the one thing that always surprises you when you build,” noted Phifer. Enclos's Mic Patterson provided a sobering note in the concluding panel on digital fabrication. Despite impressive recent projects—Hoeweler Yoon's Sean Collier Memorial of milled granite, James Carpenter's Fulton Center Sky Reflector-Net, and Kreysler & Associates/Enclos's fiber-reinforced plastic rainscreens for Snøhetta's San Francisco Museum of Modern Art—the gap between “those buzzwords we have in our industry” and seamy real-world transitions between programs or contractors can be alarming. “The obvious trend is accelerating complexity of the building skin.... How much complexity is sustainable?” Patterson asked. “All you have to do is visit a university architecture program: kids go nuts with Rhino, but nobody's talking craftsmanship.” The precise woodwork in Kahn's Escherick House, he added, “screams, 'Digitize this, sucker! '”—a challenge for everyone to take home. Like cheese and crackers, music and architecture is a natural pairing. Last November, Steven Holl debuted his ballet, Tesseracts of Time. This year is shaping up to be a promising one for synergy between the two practices: A Marvelous Order, the opera based on Jane Jacobs' and Robert Moses' epic feud, is in previews this March, and last weekend, concertgoers at the 92nd Street Y's "Seeing Music" festival were treated to a Gabriel Calatrava–designed installation that dialogues with Bach's “The Art of the Fugue." 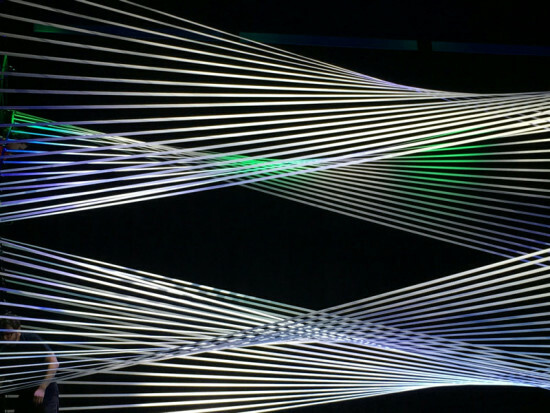 The installation, mounted in a 24-foot-by-17-foot frame, is meant to evoke the strings on musical instruments, Bach's fugues, and a game of Cat's Cradle, the children's game played with an endlessly transfigured loop of string. While the Brentano String Quartet performed Bach's piece live, dancers manipulated Calatrava's installation in response to the music. https://www.youtube.com/watch?v=d2ePyvNgVJA New shapes, spaces, and patterns are created as the dancers work. “My fascination with moving architecture inspired me to design a set piece that serves as both a work of art and a functional installation that reacts to music,” Calatrava said in a statement. In the video below, he dives into the design process and the challenge of syncing architecture, a medium with material products, to music, tangible but non-physical. https://www.youtube.com/watch?v=wsHXd-8p0PE The Calatrava name should be eminently familiar to anyone who follows architecture. The younger Calatrava, trained as an engineer, is now an architect, working on his own and with his father's firm, Santiago Calatrava Architects & Engineers. An affinity for white, sinewy geometries may run in the family: the 92Y piece recalls the elder Calatrava's recently completed Museum of Tomorrow and the soon-to-open World Trade Center Transportation Hub, below. For those interested in checking out more musical pairings, the 92Y’s “Seeing Music” festival runs through February 18. The seventh AIA Illinois Gold Medal has been presented to Carol Ross Barney of Ross Barney Architects. Barney’s career spans 40 years of practice in Chicago, in which her firm has taken on civic, social, and cultural projects across the country. Known as a champion for the public’s right to design excellence her work often is designed for the public realm. Outside of her practice, Barney is the founder and first president of the Chicago Women in Architecture. Barney is also the first woman to win AIA Illinois’ Gold Medal. Most recently in Chicago, Ross Barney Architects has received praise for its design of the newest portion of the Chicago River Walk. Just to the south, a new elevated public train station of her design has also recently opened. 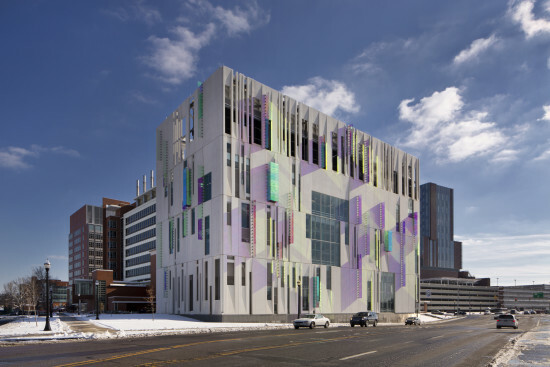 A new central chiller on the south campus of OSU highlights Barney’s commitment to high design even when it comes to infrastructural projects. Remarking on her way with mixing civic, social, and public design, Mike Waldinger, executive vice president of AIA Illinois remarked, “it’s as if Robert Moses and Jane Jacobs had a secret child.” Along with the Gold Medal, Ross Barney Architects received the AIA Illinois Daniel Burnham Honor Award for the Master Plan of the 606, a new linear park recently finished on the northwest side of Chicago. 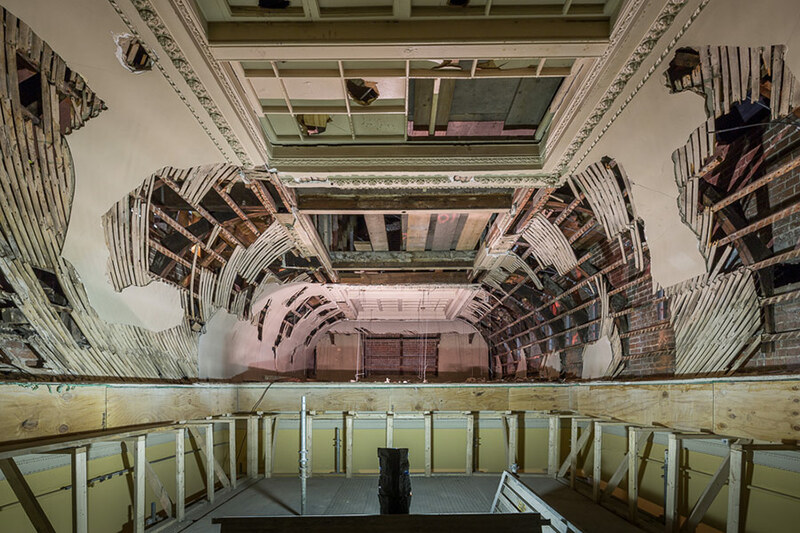 The Renwick Gallery in Washington, D. C., called the oldest “purpose-built art museum” in the U. S., will reopen to the public on November 13, following a two-year, $30 million renovation. The event is a highlight of the fall 2015 arts season in Washington. There will be a black-tie gala dinner on November 8, three new books on the museum, and an inaugural exhibition featuring nine prominent contemporary artists. Then there’s the building itself, which opened in 1863 and was designed in the Second Empire style. 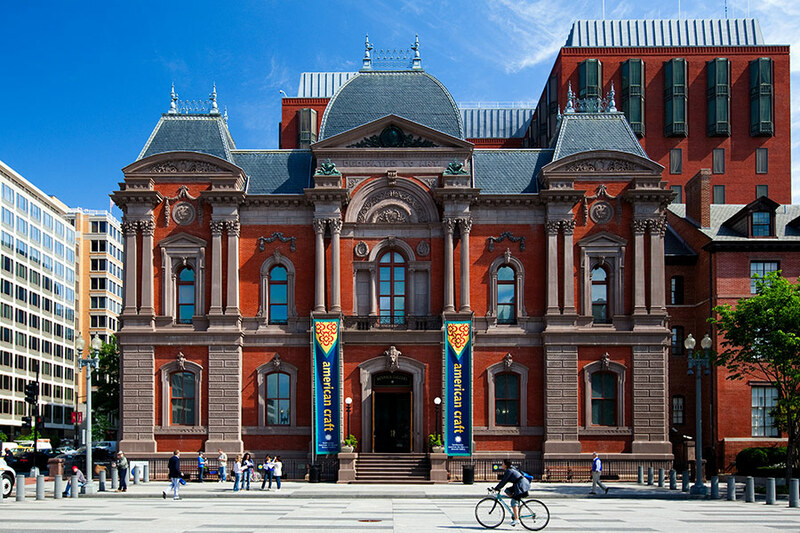 With the project’s completion, Washington gains a thoroughly renovated landmark with restored historic features and an entirely new infrastructure that will enable it to continue serving as the home of the Smithsonian American Art Museum’s (SAAM) Contemporary Craft and Decorative Arts program. The 156-year-old building, which stands across from the White House at Pennsylvania Avenue and 17th Street NW, was saved from the wrecking ball in the 1960s at the urging of First Lady Jacqueline Kennedy. The original architect was James Renwick, Jr., for whom the building was later named. John Carl Warnecke and Hugh Newell Jacobsen worked on it in the 1960s. Westlake Reed Leskosky is the architectural design and engineering firm for the latest renovations. 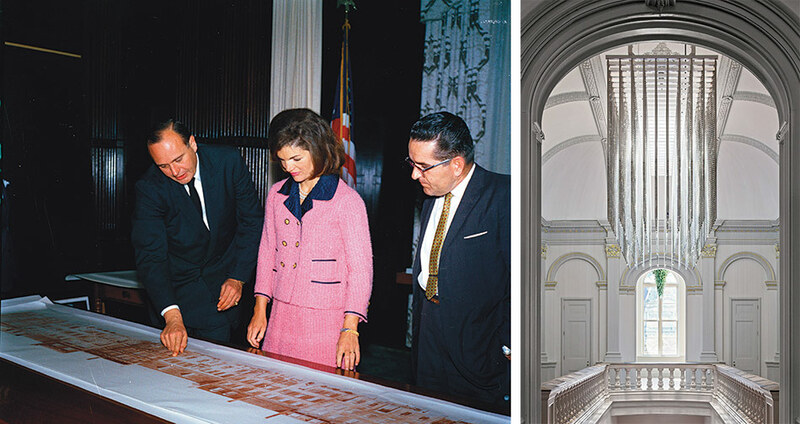 Jacqueline Kennedy examines plans for the Renwick, left. Leo Villareal’s installation complements a lighter, more contemporary color palette and gilded details in the Grand Staircase looking toward the Octagon Room, right. “The Renwick Gallery is the first purpose-built art museum in America and an architectural masterpiece. We are delighted to renew this great historic building for the next half-century,” said Elizabeth Broun, the director of SAAM. “It’s important architecturally because it helped launch the Second Empire style in the United States,” said Charles J. Robertson, deputy director emeritus of SAAM and author of American Louvre: A History of the Renwick Gallery Building, available in December. As part of the project, contractors removed false ceilings to reveal two long-concealed ceiling vaults on the second floor. They restored the original 19th-century window configuration throughout and repaired original moldings. They upgraded art storage areas, repointed exterior brick, repaired stucco, remodeled restrooms and replaced mechanical systems. Public spaces are now illuminated entirely with LED lighting. The Grand Stair has a new red carpet by French architect Odile Decq—another sign of French influence in the building. Of the three books, Robertson’s American Louvre traces the building’s history and innovations. Craft for a Modern World, The Renwick Gallery Collection, by Nora Atkinson, focuses on the permanent collection. On Wonder, by Nicholas Bell, documents the debut exhibition. The refurbished “Octagon Room” will contain an exhibit about the building’s history. Wonder, the inaugural exhibition, features installations by Jennifer Angus, Chakaia Booker, Gabriel Dawe, Tara Donovan, Patrick Dougherty, Janet Echelman, John Grade, Maya Lin, and Leo Villareal. 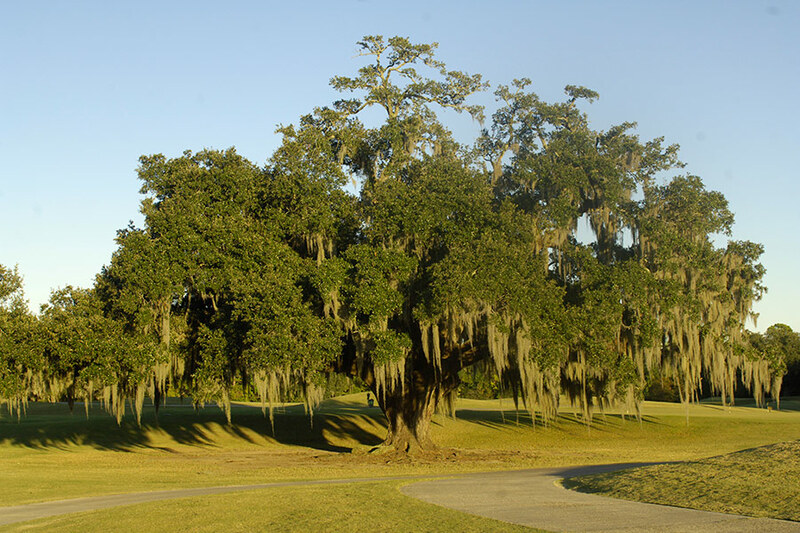 A Live Oak that the author uses as the metaphor for New Orleans' resilience. A recent essay on Hurricane Katrina by geographer Richard Campanella offers a canny glimpse of a catastrophe’s utility as an instrument of politics. Noting that “most incoming freshmen at the New Orleans university where I teach know Katrina ‘the trope’ much better than Katrina the actual incident,” he implies that when people insist upon the event as a climate change bellwether, as the symbol of a broken social contract, or as the embodiment of government failure, they are inadvertently stripping away its literal meanings. Amid the many books and articles published to coincide with the 10th anniversary of the storm and subsequent levee failure, Roberta Brandes Gratz’s book We’re Still Here Ya Bastards: How the People of New Orleans Rebuilt their City is not innocent of this tendency. It is nevertheless a welcome contribution to an animated conversation about the city and its uncertain future. Gratz’s Katrina “tropes” are government incompetence and the redemptive power of grassroots action. The villains of her story are, by and large, FEMA, sclerotic city agencies, and politically connected contractors who produced little of value despite being awarded billions of recovery dollars from the federal government. Her strong-willed, energetic heroines and heroes, by contrast, take site- and neighborhood-based rebuilding into their own hands and achieve spectacular end-runs around bureaucratic obstructions. The good guys—much like Gratz herself—understand the intrinsic value of historic preservation, appreciate vernacular architecture, and abhor cultural homogenization. They also incorporate sustainability and resiliency principles into restored landscapes and buildings, aligning with the theme of “living with water” as opposed to resisting it. In this recovery narrative, elite city planners, clueless or depraved government functionaries, and return-obsessed developers are in many cases outmatched by grassroots civic groups and small, local entrepreneurs. This is an appealing juxtaposition, one that Gratz is eloquent in arguing. Brought alive in these pages, the indifference and condescension of powerful actors in both government and the private sector toward people trying to put right their homes and lives is staggering. For example, homeowners in the Lower Ninth Ward, an isolated low-wealth (but not, contrary to official myth, low-lying) neighborhood on the east bank of the Mississippi River, faced blatantly discriminatory restrictions on access to their property for months after the storm, and then confronted perverse regulations that based payouts for rebuilding not on costs but on depressed pre-Katrina home values. In light of such barriers, the countless small triumphs described here—a renovated house, a bayou overlook restoring a long lost view to Lower Ninth Ward residents, an implemented recovery plan in the Broadmoor district—are truly impressive. Gratz implies that these accomplishments merit a more central role in the post-Katrina story than continuing residential vacancy and the plight of renter households (for whom policy did less than nothing), and one is inclined to concur. Still, the book unhelpfully perpetuates the idea that larger-bore efforts to influence (let alone staff) the government are a hopeless cause. The rental housing crisis (abetted by the cowardly destruction of the bulk of the city’s public housing), the persistence of low-wage work, and the region’s coastal restoration challenges require systemic action and leadership. But there is little discussion in the book about how to promote effective, equity-minded governance on a level broader than that of the neighborhood. All of this will be familiar to readers of Gratz’s previous books and to readers of Jane Jacobs, on whose work Gratz models her own. But if the book is formulaic at points, Gratz also has a keen eye for the way in which the systems that skewed in favor of the white and the comfortable in the storm’s immediate aftermath are now skewing that way in more subtle but equally troubling ways. She vividly explains why the ongoing privatization of schools and transit, decisions to dedicate scarce resources to infrastructure for wealthy tourists, epidemic police brutality, and the failure to maximize the ecological potential of new amenities like the Lafitte Greenway are of enormous consequence in 2015. What is most valuable about We’re Still Here Ya Bastards at this moment of mass retrospection is its intelligent glance forward at upcoming struggles, and its argument that the actions of elected officials and administrators in Washington, Baton Rouge, and Orleans Parish matter as much now as they have at any time in the past ten years. 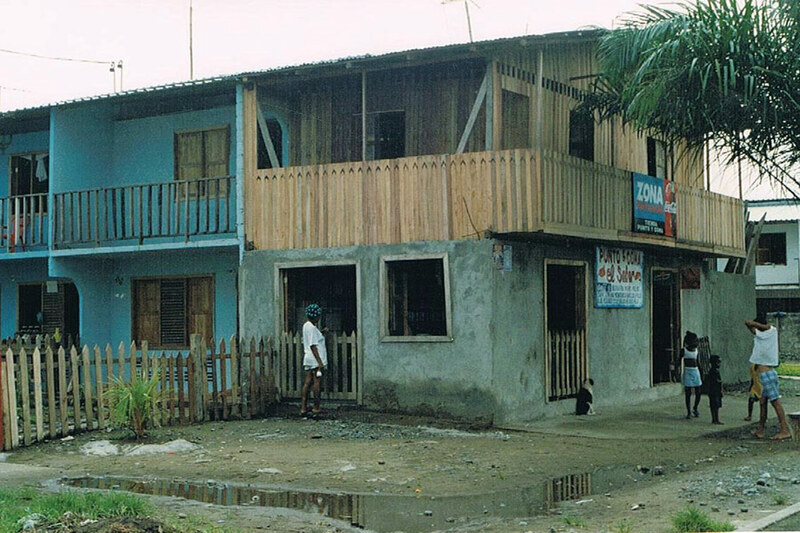 A self-help housing project lead by Roger Katan on Tumaco Island off the coast of Colombia, 1983. Among the most overused and least understood words these days are “working with the community” and “community input.” Developers, designers, and planners bring a project to a community and then try to “work with” that community on its acceptance; they tinker somewhat in response to “public input.” But they come to “educate” the community, not to “be educated” by it, and fail to recognize that local wisdom trumps distant expertise more times than not. Missed is recognition that building on that local wisdom offers the best chance of project acceptance and success. 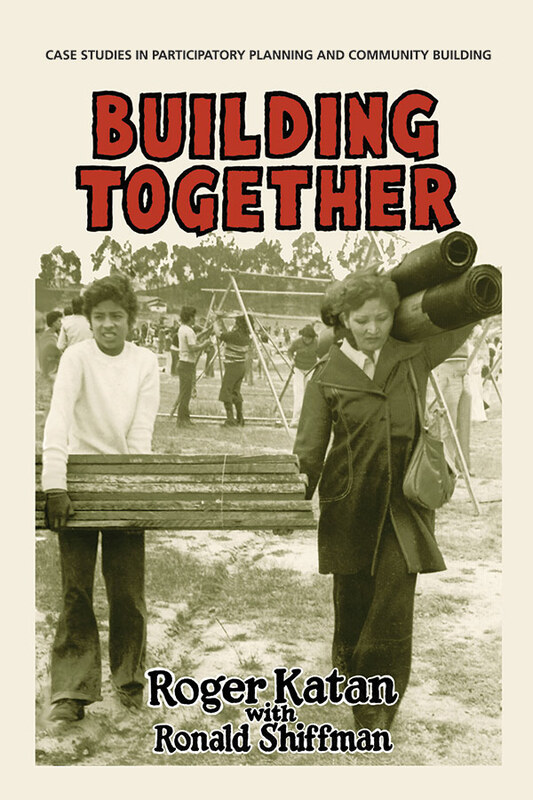 In Building Together: Case Studies in Participatory Planning and Community Building, designer Roger Katan and planner Ronald Shiffman illustrate the true meaning of collaborative design and planning through which the destiny of a community remains in local hands. Examples are offered with a great substantive and geographic range: a new multi-service center and renovating buildings to create a settlement house combined with elderly housing in East Harlem; a locally-conceived housing cluster in the Paris suburb of Meudon, France; accommodating the expansion of a local manufacturer without undermining its surrounding residential neighborhood in Greenpoint, Brooklyn; working with a self-help community of homeless people to develop self-built and self-managed housing in Pereira, Colombia. There are more, a diverse assortment, even a micro-credit union as a tool for neighborhood self-management in 1976 that evolved by 2012 into a national savings federation in Burkina Faso in West Africa. Katan and Shiffman followed different paths and came together in the 1960s, an interesting but challenging time. Moroccan-born, educated at the École des Beaux Arts and MIT, Katan had left a dream design job with the architectural firm of Louis Kahn in Philadelphia to live and work in East Harlem while teaching at Pratt Institute; Shiffman, Pratt-educated in architecture and planning, was then a graduate student hired to work for a unit at Pratt that was to morph into the Pratt Center for Community and Environmental Development inspired by the writing of Jane Jacobs. Shiffman had just been asked by Pratt to work with residents to develop a program to address urban decline in Bedford Stuyvesant; that work led to the establishment of the Bedford Stuyvesant Restoration Corporation, the first community-based development effort in the country. They worked together on some of the projects offered in the book, but mostly they were following parallel paths, admiring and learning from each other. These projects represent the early stirrings of what has become known as “advocacy planning.” They were young, somewhat idealistic, but with skills of great value to people who needed everything and not a clue where to begin, surely a circumstance true today. Young professionals, take note. Nineteen-sixties urban renewal was at its height. Few were the Davids to this Goliath. Maybe Katan and Shiffman were too young to know better, but they forged ahead and, in the process, learned lessons worth absorbing today. Urban renewal may not be today’s Goliath, but surely high stakes, high impact development of all kinds is everywhere. Some of the lessons offered here have been learned to some extent. More cross-disciplinary collaborative work is occurring; some silos are being penetrated. Indigenous building techniques from around the globe are gaining respect and new adherents. The public in some places is better educated about development, often eager to offer sophisticated alternatives to inappropriate plans. Local empowerment is not an alien concept. Professionals are learning to listen, really listen, to citizen voices making possible new and formidable partnerships. Equity and socially responsible design are not the foreign concepts they were in the 1960s, but are not as prevalent as they should be. The winds of change are out there bringing more of these ideas and practices to the forefront. A new generation seems poised to take up the challenge. For inspiration and some ideas for directions to follow, no better place to begin can be found than in the pages of this book.